Now that the Disney Dream inaugural celebration has come and gone, we get an inside peek into what this luxury Disney-themed ocean liner has to offer. And while there are oodles of things for family and kids to do while on board, let’s not forget about the adults. This post takes a photo look at some of the “adults-only” amenities the Disney Dream offers. Disney Cruise Line’s first new ship in more than a decade, the Disney Dream, was floated out today from a dry dock in Papenburg, Germany. 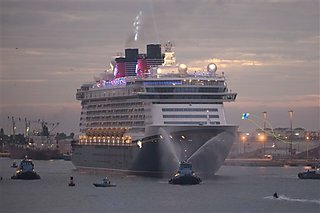 Large crowds of cruise ship fans lined the waterfront at the Meyer Werft shipyard to watch the 128,000-ton vessel emerge from the covered dock for the first time, erupting into cheers as it cleared the structure. With the maiden voyage for the Disney Dream a little more than 6-months away, the ship, still under construction, is really starting to take shape. Disney Parks Blog has released a short video showing the construction progress to date with some amazing renderings of what the end product will look like. 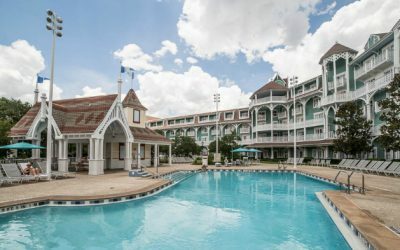 Disney has finally decided upon a name for the resort they are currently building in O’ahu, Hawaii. The resort, which is slated to be open by Fall 2011, is called “Aulani” which is Hawaiian for “the place that speaks for the great ones” or “the place that speaks with deep messages.” Additionally a new web site has been launched which will featuring concept artwork, construction photos and more information about the resort. Disney Cruise Line revealed some new details about its first new ship in over a decade — the 128,000-ton, 4,000-passenger Disney Dream at a festive show-and-tell today at Guastavino’s in New York City. Castaway Cay, Disney’s private island paradise in the tropical waters of the Bahamas, is getting an extra dose of pixie dust. Enhancements will provide guests with more water-based family-fun, additional conveniences and a slice of beachside luxury all designed to complement the idyllic island setting. Disney Channel and Disney Cruise Line have teamed up to create the most star-struck Disney cruises ever, complete with Disney Channel talent Q&A sessions, photo ops, parties, concerts, and more. What’s even better is that you can be there! Enter the Summer at Sea Sweepstakes for a chance to be one of eight lucky families of four who will be joining in the fun as official vide-BLOG-raphers on a cruise between July 9 and August 6. This spring promise action and adventure on the high seas as Disney Cruise Line features “Pirates of the Caribbean: The Legend Lives On.” This cruise will take guests to world’s end and beyond, led by actors Lee Arenberg and Martin Klebba – better known to fans as Pintel and Marty from all three “Pirates of the Caribbean” films. This high-seas journey promises an earful of behind-the-scenes movie lore, tomfoolery, and exclusive treasures .